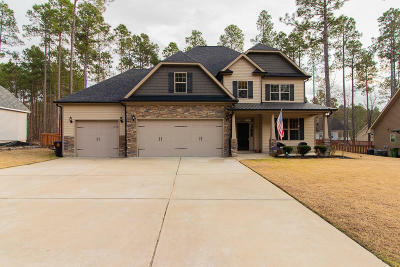 Don't wait to check out this beautiful home in Carolina Lakes. Move in ready with fresh paint, new HVAC units, new dishwasher and new carpet installed. Upon entering the home you are welcomed to an exquisite foyer and a spacious formal dining room. Right off the dining room is a cook's dream kitchen with lots off storage and stainless steel appliances. The kitchen opens up into a lovely living room with cathedral ceilings. The master bedroom suite is large and offers an amazing bath plus walk in closet. All additional rooms are incredible. The third floor has been finished and can be used as a bonus room/game room or can serve numerous needs. The backyard is perfect for warm Carolina summers. An in ground 8ft deep salt water pool 40x16 is perfect for family fun and entertaining guests!